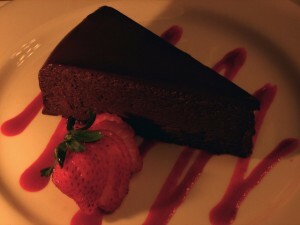 Gluten Free Chocolate Cake ~ good for PESACH too! I used this chocolate cake recipe for the first time when a young friend of ours, who was volunteering in Jerusalem, came to our home for an Erev Shabbat meal together with her mother and sister. I try to remember to ask, when we have visitors for the first time, if they have any food allergies or aversions. It turned out that our friend’s mum is gluten intolerant, so I went searching for a yummy dessert. Since I am a dark choco-holic I found this recipe and adapted it a bit to suit our needs. It is rich and very ‘more-ish’ – especially with the whipped cream on top. 2. In a medium saucepan, heat the butter with 1/4 cup of heavy cream over medium/low heat until the butter is melted. 3. Add the chocolate and stir until the chocolate is melted and smooth; remove from heat. 4. In a medium bowl beat together the eggs, granulated sugar and cocoa powder. Add the chocolate mixture and beat again. 5. Transfer the batter to the prepared pan and bake until puffed and set, 35-40 minutes. 6. Let it cool in the pan for 1 hour. Run a knife around the edge of the cake before unmolding. Beat 1 cup heavy cream with 1 Tablespoon of sugar and 1 teaspoon of vanilla until stiff peaks form. Serve cake with a large dollop of whipped cream on top. You can also add a few raspberries or srawberries for a splash of color! This entry was posted in Uncategorized by Keren Hannah. Bookmark the permalink. This looks and sounds wonderful ~ A recipe I will definitely try. Thank you Robbie! Copyright © 2019 HIS-ISRAEL. All Rights Reserved.